Only a few weeks left until school’s back in (or maybe it just feels that way because I’ll finally be heading back to teaching after 4 years off raising my son!). 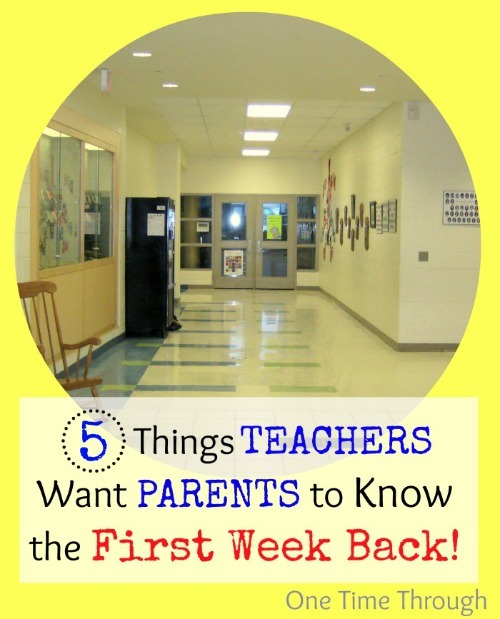 As an Elementary School Teacher for over a decade, I have an insider point of view on what teachers want parents to know the first week back to school. Here are 5 things your child’s teacher might wish they could tell you, that will help your child start off the school year on the right foot! This post contains Amazon Affiliate links. See full details in our Disclosure. 1. TIRED kids have a really tough time adjusting the first week. There is so much to learn, and adjust to, in the first week back at school, regardless of the grade. Those little brains are busy, busy, busy learning routines, getting used to a new teacher and classmates, and adjusting to a different level of activity than they have in the summer months. This is all fun and EXHAUSTING! Being overtired to start the year, can make it not only exhausting, but overwhelming for some kids. Kids who are tired have difficulty learning, focusing, and paying attention. You may also find that they come home and have a meltdown from the stress of all the new demands and trying to deal with them when they’re tired. If your child is on a sleep schedule that’s quite different from what they will be doing when school’s on, I would strongly recommend pushing the bedtime earlier gradually over this weekend (or even the week before), so that the first day back is not a SHOCK to everybody’s system! It will make for smoother mornings, and days, for everyone if your kiddo is well-rested and ready for their day. 2. Those NOTES sent home by the teacher have CRITICAL information for the entire year. It’s my chance to introduce myself, let parents know my philosophy, and to communicate critical information that will affect the whole year. In that first note, I usually let the parents know what the best way is to get a hold of me, I list all the important things that kids need to bring (think: gym clothes, lunch items, etc. ), and any important information about forms and extra money that is needed for supplies. Believe me – this is not stuff you want to miss out on knowing! It’s not fun if kids have to miss out on gym the first week because they don’t have running shoes, or they miss the first milk orders because the deadline was missed. On a side note, be sure to get those forms back as soon as possible. It’s frustrating to have to remind the kids for weeks to get these things in and it often cuts into class time that could be used to learn. 3. HUNGRY kids make poor students. 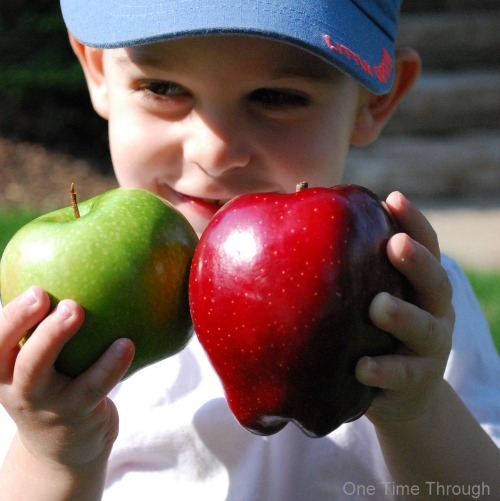 Here’s the truth – if kids don’t like what’s in their lunch, they won’t eat it! You may find the lunch bag full at the end of the day. Or, it may be empty… but that doesn’t necessarily mean your child ate their lunch! Almost every year, I have caught students tossing food in the garbage that they didn’t want to eat, but they knew if they brought home, they’d get in trouble for not eating. I’m not always in the classroom monitoring eating either – sometimes it is paid supervisors. Here’s an idea that I read years ago in a magazine. Sit down with your child this weekend and brainstorm things they want to eat for lunch at school. Make sure you have some ideas for grains, proteins, and fruits and veggies, and maybe treats. You could even go shopping together so your child gets invested in their choices. Each night, make it a routine to have your child choose an item or two from each of the food categories for their lunch the next day. You could even have bins for each category in your fridge to make it super-easy! 4. If your child has a severe ALLERGY (or any other medical condition that we need to know about immediately), we’d love to hear from you BEFORE the first day of school. As the person responsible for your child’s safety while you’re away, I want to be as informed as I can be right from the first day of school. If your child has a life-threatening allergy – or any other serious medical condition that will need to be monitored closely – even more so. Please don’t be afraid to contact me prior to school and/or ask to meet with me at the end of the first day to discuss your child’s needs. 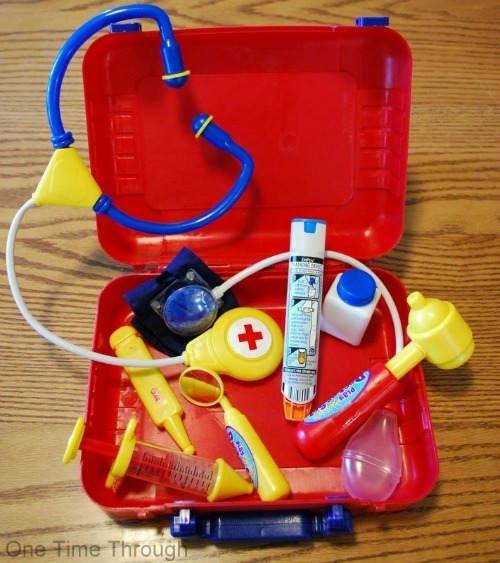 If your child has an epipen, I would feel most comfortable being shown how to use it and being told exactly when to use it. Even better if the instructions are written down. I want to know what precautions should be taken in the classroom and at mealtimes, and I want to know if it’s okay to share this information with other parents and other students. Please realize that having this discussion RIGHT before the bell goes on the first day is probably not the best time for me to give you my full attention. If that’s the only time you have, give me the facts I need for the first day and let’s arrange a time after school to go over things. Want more info? Read: 5 Ways to Prepare an Allergic Child for School and How to Keep Your Allergic Child Safe at School. 5. What kids report at home about the school day ISN’T always accurate! If all you get in answer to, “What did you do today honey?” is dead silence, or “Nothing!”- please be assured that isn’t the case. As I mentioned above, the first week (heck the first few weeks) of school are incredibly busy. The kids are learning all the basic routines and expectations, and they’re getting to know each other, and our classroom, and me! As if that’s not enough, as their teacher, I’m busy trying to find out what is going to motivate each of my students to learn, I’m observing their learning styles, and I’m trying to figure out how and who they work best with. Very little of this critical information is gathered through “formal” lessons. To get your kids to open up more about their day, Adele Faber and Elaine Mazlish, authors of How to Talk So Kids Will Listen & Listen So Kids Will Talk , recommend just welcoming your child home warmly when you first pick them up by saying something like, “It’s so good to see you! Welcome home!” with a hug. The idea being that if you don’t ply them with questions, they will come to you to chat when they are ready and have decompressed a bit. 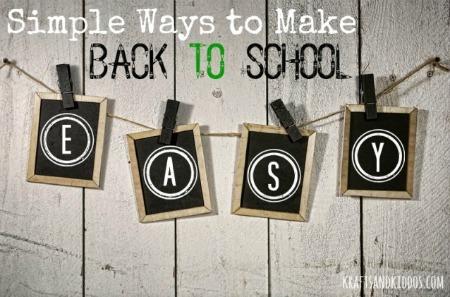 Now that you’ve got my best insider tips on starting the school year off in the best possible way, it’s time to share some awesome back to school posts from bloggers around the net! For 7 terrific tips on helping get the kids out the door on time, be sure to read this post by Krafts & Kiddos. 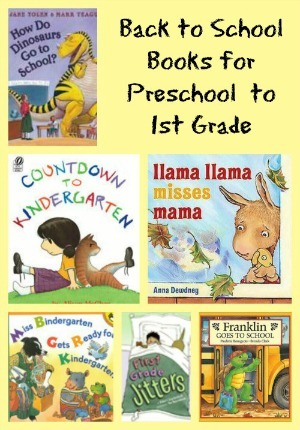 KC Edventures has a great list of back to school book books for preschoolers to grade 6s. For each book, she has a short description too. Dabbling Momma shares a couple easy ways to organize your child’s written work and and art for the school year. If you plan on home-schooling your child or children, be sure to take a peek at this homeschooling mom’s school room as well as read her tips for starting off the year at The Mad Mommy. 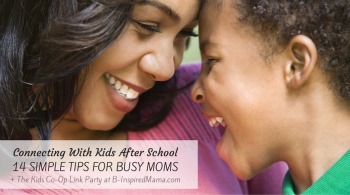 Once the school year is back in swing, you might want to read this terrific post sharing ways to connect with your kids when they get home from school from B-Inspired Mama. Follow One Time Through’s board Back to School on Pinterest. I hope you are fully enjoying the remaining weeks of summer vacation! Remember to follow me on Facebook, and Twitter! 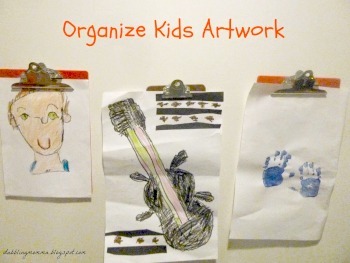 Hi Sue, thanks so much for sharing our post on how to organize kids artwork! I am going back now to read some of the other posts you featured! Really enjoy the Love to Learn linky! Thanks so much for linking up Susen!